You can manage the Rule Engine dynamically using the Rule Engine Server. Rule Engine Server is an optional component of Accounting Integrator. It provides an online accounting transformation service by encapsulating and dynamically managing a set of AccountingIntegrator rule engines instances. 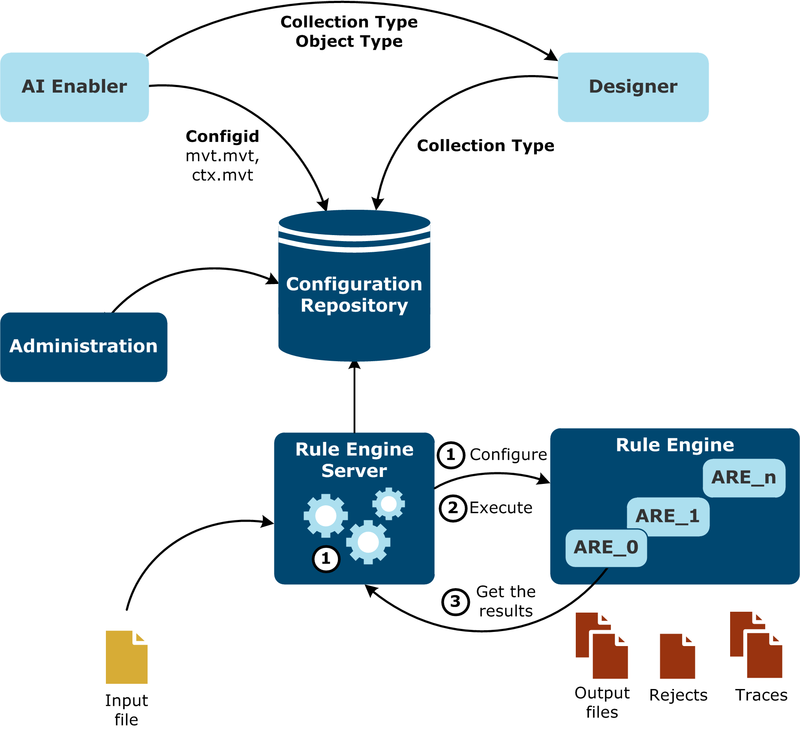 Rule Engine Server also provides a REST API to be used with an external orchestration tool. For how to use REST API for Rule Engine Server, see Configure using REST services. One Rule Engine Server handles the runtimes for oneRule Engine core and must be installed on the same physical machine. TheRule Engine runtimes can be managed either manually or using Rule Engine Server. Conflicts can appear if you configure several runtimes manually for the same Rule Engine core and use Rule Engine Server to manage them. Rule Engine Server cannot know which are the runtimes that were configured manually. If you implement Rule Engine exits, you must put them in the core installation from where Rule Engine Server creates the runtimes. You cannot have different implementations of an exit on the same installation of Rule Engine core. Rule Engine Server creates runtimes dynamically in the runtimes folder, under the Rule Engine root directory folder. Note The maximum number of runtimes the Rule Engine Server can create automatically is restricted by the AccountingIntegrator license. The runtimes created automatically by Rule Engine Server are named ARE_i, where i will take values from 0 to n, n being the maximum number of runtimes that can be created. The following graphic illustrates the behavior of Rule Engine Server. Rule Engine Server receives a file to process, with its AccountingIntegrator configuration name and the Processing Context-In name as Collection Type name. With optional configuration update if the instance configuration is not updated (RDJDEP). This check is done according to the Repository configuration version. When the maximum number of instances authorized by the AccountingIntegrator license is reached, it waits for one available instance.